WARNER! NH: Fall Foliage Festival! 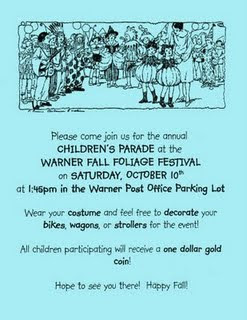 The Festival is Warner's invitation to share the natural splendor of New Hampshire's vibrant autumn colors while enjoying food, entertainment, carnival rides and fine crafts along the main streets of Warner. The Festival is organized and operated by hundreds of local volunteers. During the festival, good folks from all walks of life volunteer to cook, sell tickets, wash dishes, carry soda, flip chickens, steam lobsters and become 'refuse collection specialists,' all to raise money for community projects.